This is my story of how I earned this credential in three months time. 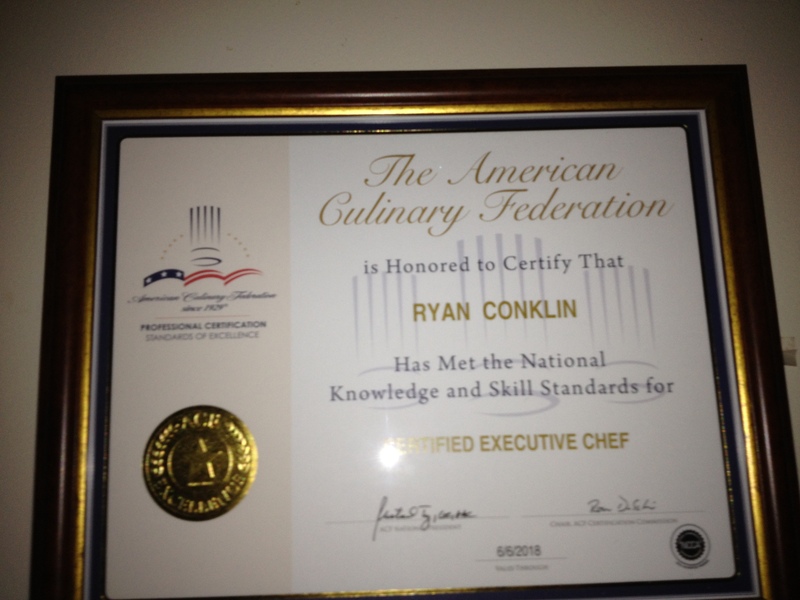 There are just over 3,000 chefs that hold this credential, and I am one of them. The following is a short story of how I did it. August 15th, 2012- Raleigh, NC. When getting my annual performance review from my boss Jim McGrody, I said the words for the first time…”Certified Executive Chef.” It came out, when we started discussing my personal goals for the upcoming year. I told Jim, “If I put this down on paper with you now, it will make it formal, and It will give me the push I need to make it happen.” Although he was proud that I was putting it down, I think he thought that it would be challenging for me. Once thing is for sure, he of all people would definitely hold me accountable if I didn’t reach my goal, at the same time he would support me if I had achieved it, and give me every resource needed to do so. After my initial application was approved, and I’d fulfilled my educational, on-line, and work experience requirements, I was given permission to take my written test. On this day, I left work, and drove south about 15 miles on US Rt.1 to Apex, to take my written exam. Although I havent been tested on these competencies in years, I had confidence because I was properly prepared. Days studying on my Ipad in bed, taking on-line quizzes, reading classical cookbooks, and digging through my books from my days at The CIA. The result….I passed. Now the process was rolling. After passing the written test, it was time to prepare for the big boy, the one everyone is scared of, the cooking practical. It was at this time that I started gathering thoughts about my menu, and shooting ideas off of others who have taken the exam. I changed my menu three separate times before committing. Practice runs soon would start. My first run at the cooking practical was what I like to call a “hot mess”. I wasn’t focused, and was trying to think and do other things at the same time. Knife cuts, sanitation, and organization were all things that I had to go back to the basics with. On this day I realized that I had to be more focused with this. Cooking and breaking down lobsters, fabricating whole chickens, trimming fresh artichokes and precision knife cuts were what I practiced. It was hard to break away from the daily operation to do this, but I made it work the best as possible. I can remember setting up the deep fryer in my home kitchen and frying artichokes at 11:30 pm when the kids went to sleep. This is what it took, I was striving for something earned, and not given. My first 3 hour and 15 minute run that would be monitored by a proctor, who was Chef Steve Pexton from Rex. Steve is who I wanted because of his attention to detail, and mature palate. I told him to harass me, follow me around, and be honest. This was tough to do as a chef, opening yourself up to critique, but I knew that I’d rather take the hits now rather than fail in New Orleans, which was never an option to me. This practice session went so bad, and I finished 15 minutes late. My food wasn’t seasoned, lobster was overcooked, and organization was lacking. That night, I decided that I wasn’t going home, until I had at least my lobster and chicken dish right. So back at work I was in my 13th hour of the day cooking and breaking down the remaining lobster I had. I cooked lobster for my line cooks and various team members that night. They loved it, but more importantly I had found my way. It was just as I had wanted it. I left my local food market early that morning after spending $48.00. What did I buy? A dozen artichokes and four whole chickens. I was going to get them right before my next practice run. So as my wife and kids watched on a Saturday morning, there I was on my kitchen island, turning fresh artichokes, and frenching the perfect chicken breasts. Searing the perfect chicken, and making each one golden brown was what I did while my son watched and asked questions. I had many other things that I was ignoring like yard work, and laundry, but I had to stay focused. I needed to be perfect. I spent half the day at work gathering my prep and final menus and checklists for my last practice run, and my eventual drive down to New Orleans. My bags were packed, but I had one more practice run left the next day at The Chef’s Academy. My last and final practice run before my trek, and Chef Steve Pexton was there again for me.Was I perfect at this time? No. Was I more confident? Yes. I knew that this was my last time to practice, so after this run through it was all on me. Once again, at this time, the thought of failing wasn’t an option for me. On that same day at 4pm, I left Raleigh, and started my 14 hour drive to New Orleans. About 2 hours in, I connected with Chef Eric Eisenberg from Swedish Health Services in Seattle via telephone. He would be taking his exam at the same time, so we were putting each other at ease, and sharing our practice session tips and mishaps. We both talked about sanitation & organization while finalizing our plans to shop for ingredients while in New Orleans. This was the day before the test. Chef Eric and myself ventured out for a pre-test walk-through at Delgado Community College. Chef Vance Roux CCC CCE from Delgado showed us the kitchen & gave us a printed timeline for the following day. It was the first day of school for students as well, so the place was pretty busy. After our meeting, Chef Roux spent about 30 minutes talking about hurricane Katrina, and what had happened from his viewpoint. This was one of the most interesting and insightful conversations I had in sometime. After leaving, we ventured off to one of the best restaurant supply stores that I had ever been to called Caire Restaurant Supply. This placed was packed wall to wall and sky-high with all of your culinary needs. Chef Eric picked up a last-minute ring mold, and then we were off to go food shopping. We spent the next 4 hours foraging for our ingredients at Rouses Market and then at Whole Foods. Pristine quality salmon, lobsters, whole chickens, and produce were on the agenda. I was looking for things like the perfect bell pepper, artichokes that were just right, and the freshest looking Belgian endive in New Orleans. Everything right down to the fresh tarragon and parsley had to be of the finest quality. No exceptions. At around 6:00pm, we had arranged to work in the 3rd floor pastry kitchen of the Sheraton New Orleans to do some organization and mise en place. We treated our ingredients like a newborn baby, and organized our coolers for our early morning departure. This process took us to 11:00pm, a long day, but we knew that we had done everything in our power to be properly prepared. We met in the pastry kitchen of the Sheraton, and proceeded to pack the car and head towards the test site. At 7:ooam we arrived and started to unload and organize our areas. At the same time, a chocolate-colored Jeep pulled up to the loading dock, and out of the car came three chefs from the Louisiana Culinary Institute in Baton Rouge. They were my evaluators, they would validate my skills. Things just got real. At 8:15 am I, who had chosen to cook first, presented my menu to the evaluators, and started to dance in the kitchen. For three straight hours, I did as practiced, and executed my plan. As the evaluators followed me around the kitchen with clipboards in hand, it didn’t phase me one bit, because I was confident, and felt comfortable with my preparation and ability. I had my swag, nobody was going to take this from me. About 45 minutes later after a brief meeting with the evaluators, I had learned my fate, and one of the pot washers took this picture of me as I left the room. 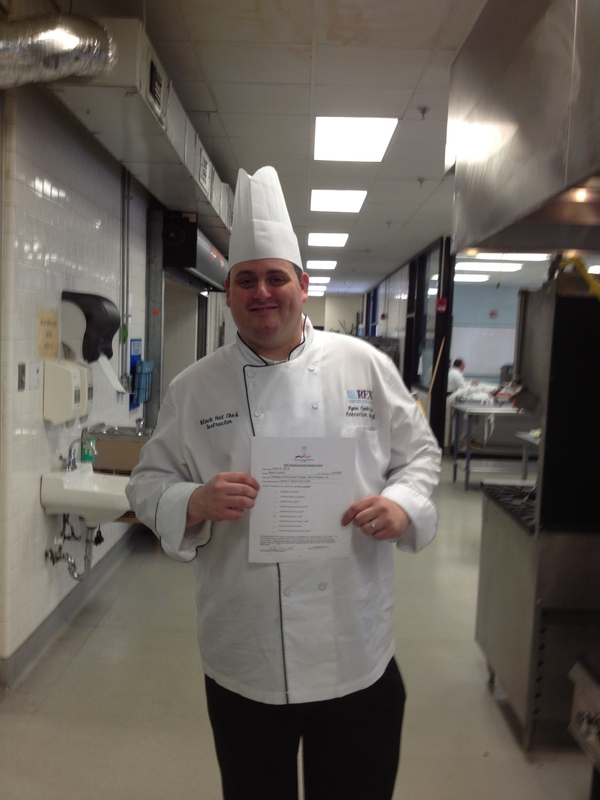 I had achieved my goal, I earned the credential of Certified Executive Chef. Also, congratulations to my colleague Chef Eric Eisenberg CEC returned back to Seattle as well, with his goal accomplished. This entry was posted in food and tagged Black Hat Chefs, Certified Executive Chef, chef, Chicken stock, hospital food, Knife Cuts, Salmon, The Chef's Academy. Bookmark the permalink.